This is a LARGE book weighing in at 7# and a fabulous addition to your avian library. Makes a great coffee table book or terrific gift as well. Previous editions of Australian Parrots have been widely acclaimed as the standard reference works on these spectacular birds for almost forty years. 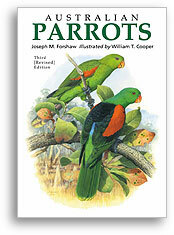 Joseph Forshaw and William Cooper have now prepared this fully revised, greatly expanded third edition, another outstanding production from this world-renowned partnership and the most comprehensive account of Australia's cockatoos, lorikeets, and parrots. To accommodate taxonomic changes, some new paintings have been prepared by William Cooper, and these enhance both the visual attractiveness and scientific accuracy of the book. This new edition will be welcomed by all parrot-lovers in all countries, and will be particularly helpful to aviculturists seeking to know more about parrots in the wild as a guide to their own husbandry techniques. perfect gift for your parrot loving family and friends ... and we'll even drop ship it for you! Outside the United States, shipping will be discounted accordingly.